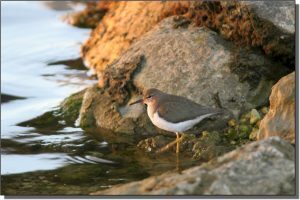 Description: This robin-sized, chunky sandpiper has relatively short pink, yellow or orange legs. The breeding plumage consists of a brown back, wings, neck and head, with dark streaks and barring. The belly and undertail are white with a varying number of dark spots. The bill is medium-length, yellow, orange or pink and black-tipped. Nonbreeding plumage is similar but without the spotting, streaking or barring. The tail extends slightly past the wing tips at rest. 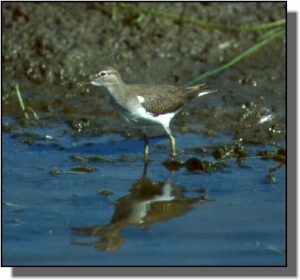 The first impression of a Spotted Sandpiper is that of a constantly bobbing rear end. In flight, they have a unique “flutter-stall-flutter” pattern of shallow wing beats. Similar Species: Solitary Sandpipers, although slightly larger and slimmer, are similar in plumage and bob like Spotted Sandpipers but their movements are slower paced. 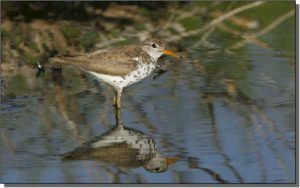 Comments: Spotted Sandpipers breed throughout central and northern North America and winter along the North American coast and throughout northern and central South America. They are commonly found as single birds or in small groups along shorelines of rocky lakes, reservoirs and rivers. Females are slightly larger and more heavily spotted than males, defend a breeding territory and are polyandrous (attempt to mate with more than one male).